What a busy month August was! I spent almost 3 weeks in Norway fishing for England in the World Flyfishing Championships. We finished in 8th place from 25 countries and I had a top 20 placing individually, coming 17th from 128 competitors and becoming Top English Rod. All but 3 anglers had at least one blank and those 3 ended up in Gold, Silver and Bronze medal positions. I had just the one blank, but some poor soles had 5 in a row! The Championships were very hard, with many of the river and lake pegs not producing a single fish for 15 hours of fishing - basically not good enough for a host nation such as Norway, where there are so many great rivers and lakes! The Norwegian controllers were superb and very friendly. Scenery spectacular. Prices of everything were rediculous though. We didnt complain too much, but I really felt for countries like Australia and the USA who travelled on up to 7 flights and a team spend of around 100,000 dollars to fish bits of lakes and rivers that were completely devoid of fish! The organising body, FIPS Mouche should be thoroughly ashamed of themselves for allowing this to happen! On 23rd and 24th August I returned and ran the Lexus Team Final for 22 Teams and 132 anglers. Rutland Water was the venue and the match was excellent. The new Lexus Team Champions are Seighford Sharks, with Harvey Angling Margam runners-up and 3rd were Hanningfield. Then it was off to Sweden, with a few days of guiding on Chew before I went. We were taking the Lexus Prizewinners to fish for trout, pike and other species in an exclusive venue near Ribbinforrs. Rob Honour and Andrew Esplin were the guests and Martin Founds of Anglers World Holidays provided the holidays as a main sponsor. Both Rob and Andrew caught trout, pike and perch, while I had a day on Lake Vanern - the biggest freshwater lake in Sweden - and had pike on lures to double figures, but I also had 3 Asp - the biggest of which went over 12lbs. Asp are predatory fish and this was my first introduction to them. I certainly want to go back and catch some more - they are awesome! A few days after I returned from Sweden, I had the Lexus Individual Final to run on Chew Valley Lake. 100 qualifiers were coming from all corners of the UK, plus Belgium, Norway and France. Anglers were practicing on Chew for days prior to the Final and the lake fished really well. The new Lexus Champion is Ben Dobson who runs Stocks and Bankhouse Fly Fisheries in Lancashire. Ben not only won the car, but had the biggest fish as well so won the holiday prize too. Well done Ben. You can read the full story of both the Team and Individual Finals in Trout Fisherman Magazine and on-line in the Total Flyfisher site. Next week I go to Ireland to finish filming for the Irish Tourist Board. Des Taylor and I will be fishing for bream and pike, while Baz Smith will also be joining us for some of the same. I've recently been guiding on Chew and Blagdon and both lakes are superb! Quality trout with loads over 3lbs and most feeding in the top 2 feet of water at the moment. Dries or Washing Line tactics are the best methods and the back-end looks like being as good as last year - and that was incredible!!! Once I return from Ireland it will be guiding until the end of the season. I still have some availability, so if you fancy a day, then please drop me an email. I am now on Facebook & Twitter and update these social media sites on a daily basis. We are now officially into the longest sustained spell of hot weather for 10 years - and it looks like getting even hotter! Earlier last week I fished with Mike Purseglove on a hot, sunny and near calm day on Chew Valley. There were fish rising so I couldnt wait to get out and at 'em! However, none of these fish rose more than once and it soon became clear that they were not feeding on the surface. What they were doing escapes me. Thankfully Mike soon had a nice rainbow on the washing line. But then it got really hard and it wasnt until I fished a DI7 near the aerators that I started to catch fish - and one was a cracking 4lb plus brownie. I am back on Chew tomorrow for pike, so it'll be interesting to see if they are feeding in this hot weather. With all the fry around, they can feed easily and without much effort. I have a feeling we might get a decent fish tomorrow - but I'll let you know. I am typing this blog sat in the Lodge at Stocks Fly Fishery near Blackburn. Over 100 anglers have supported the 3 days of Heats and suffered some of the hottest weather this year. Thankfully the catch rates have been pretty good. day 1 saw a catch per rod of 1.9 and an average weight per fish of 2lbs 3ozs - but it was a Floating Lines Only Heat, so we thought it would be hard. The next day, 40 anglers averaged 3.0 per rod at the same average weight, but most reverted to sinking lines. Top man was Derek Moore who had 8 fish, as did his boat partner John Brown - so 16 fish to the boat. Good Angling! Today is the last Team Heat of the series and 3 teams will progress to the Grand Final to be held over 2 days at Rutland Water in August. Next weekend sees the final 2 Heats of the Lexus Individual Championships at Draycote Water. There are still some places available, so please contact me or Draycote to reserve your place. Two days of consistent Team performances with no blanks assured Anglo Welsh FF finished in 3rd place on Day 1 and 1st Place on Day 2 to take the covetted title of 2012 Lexus Team Champions. In fact, they were so consistent, even if they had a blank - which would count as 132 place points against them; they would still have been Champions! In 2nd place for the 3rd consecutive year, were the ever consistent Rio Masters team and in 3rd place were Margam FF from Wales. This year, the Team matches have been fished to FIPS Mouche World Championship rules, where all individuals' positions in the match are added together and the Team with the least place points are crowned Champions. This format suits the more consistent teams and no longer can 1 individual's performance carry their team through. Most of the competitors enjoyed the new format and most importantly, more Teams entered this year than last. Cliff Waters will have full pics from both the Team and the Indiviedual Finals on his "Fishy Pics" web site. The Renegades lead the challenge for Lexus Team Champions 2012 after the 1st day of competition, having amassed the lowest total place points score of 235 points.. 22 Teams are battling it out over 2 days here at Rutland Water and the sunny, windy conditions did little to help the elite field of 132 anglers. Although the fishing was hard, the quality and size of the Rutland trout was extraordinary. Average weight was 2lb 9ozs and the best fish to the scales was a Brown Trout weighing 7lbs 3ozs and fell to the rod of Trout & Salmon Magazine's editor Andrew Flitcroft. Top rod on Day 1 was Warren Gain of the Fishhawks, with 6 fish for 20lbs 12ozs, including a 6lb 1oz Rainbow Trout. Warren was closely followed by Blagdon's Mark Miles with 7 fish for 20lbs 8ozs and Margam's Rob Honour with another 7 fish weighing 19lbs 15ozs. The match is fished to FIPS Mouche World Rules where points are allocated to individuals based on their position in the match, so no one individual can dominate the Team's results and every team member's contribution counts - with a blank adding 132 points to the Team's score. So every angler is now trying to avoid the dreaded blank at all costs and team work is everything! In 2nd place are the reigning Champions, Alba Orvis FF from Scotland with 282 points, 3rd are Anglo Welsh FF with 284 points, 4th Seighford Sharks with 329 points and 5th are Rio Masters with 338 place points. In 6th place are previous Champions Team Airflo with 342 points, 7th are another previous Lexus Champion Team; the Ospreys, with 342 points, 8th are Sonik Sports Pitsford Pirates with 358 points, 9th are Nymph-O-Maniacs with 367 points and in 10th place are Iain Barr Team Costa with 378 place points. The conditions at the start of Day 2 were far better, with lighter winds and a cloudy sky. There was another even split, with boats heading for both Arms and some to the main Basin. I predict more fish being caught today than the 253 caught yesterday! 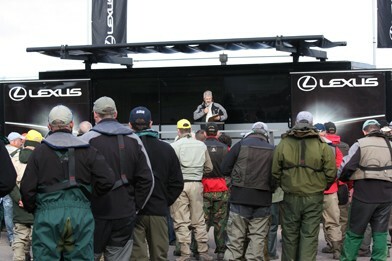 The 2012 Lexus Team Final has just started here at Rutland Water, with 22 Teams and 132 anglers competing for the title of Lexus Team Champions. When the shotgun start signalled the "off", the boats split pretty evenly, with 28 heading up the South Arm, 17 to the North Arm and 21 boats opting for the Main Basin. Practice here has been hard, with bright sunny skies and a biting sharp wind making things difficult. The winds have dropped a bit today, but it is still cold and sadly; still bright and sunny - often the kiss of death for feeding trout! The anglers are fishing to a 4 fish kill, then Catch and Release, with every returned trout counting as 2lbs 4ozs; the average weight of trout here at Rutland Water. The reigning champions; Alba Orvis Flyfishers are here to try to retain their Trophy and previous Champions Iain Barr Flyfishing, Team Airflo and Ospreys are also attempting to recapture their titles. For the first time we have a ladies team in the Grand Final - the Damsel Nymphs from Scotland. We wish them well and the other 17 Teams who have done so well to be at this Grand Final. I will update the match situation after the first day weigh-in which takes place at 1800hrs and will take at least an hour to complete. On Saturday I ran the Lexus Individual Final on Chew and today (Monday) I am flying out to the USA - Jackson Hole to be specific. I have been invited by my American World Team friends to share a few stillwater secrets. Having done the same in Australia, Canada and Tasmania, I had no reservations about doing the same in the US of A! More of this trip when I return. Lexus Final a raging success. We have a new Lexus Champion for 2012 - Alistair MacGillivray from Scotland- and SKY TV were there to record the entire event. Alistair's name is now the 12th name on the prestigious Lexus Trophy. Alistair caught his 10 fish limit weighing 26lbs 10ozs by 3:30pm and was the clear winner on what was a cracking fishing day on Chew. Craig Barr was the only other competitor to take his maximum bag, but it took him until 5:15 to finish and his weight of 23lbs 15ozs meant that Alistair's time bonus got him the ultimate prize in fly fishing - a Lexus RX450 Hydbrid SUV - and what a prize! The Bronze medal winner was Charlie Abrahams, with 9 trout for 21lbs 6ozs. The holiday prize for the biggest fish of the Final went to Andrew Esplin for a magnificent 8lb 9oz Brown Trout. This is the 2nd time on the trot that Andrew has won the holiday prize for the biggest fish of the Final! In 4th place was Lee Patten, 5th was Peter Andrews, 6th Steve Docherty, 7th Marco Orsi, 8th Lee Bartlett, 9th Alan Williams and 10th was Bill McIlroy. The next Lexus Final is the Team Championships, where 132 competitors representing 22 Teams, will be competing at Rutland Water on 15th and 16th September. Hot off the press, here are the venues and dates for the 2012 Lexus European Flyfishing Championships. Lexus Entry Forms will be mailed to all existing competitors within the next 10 days and the Lexus Web Site will be updated soon, where Entry Forms can be downloaded. Entry Fees for the Individual Heats remain at £30 for first entry and £25 for subsequent entries. Team Fees are £165 per Team of six anglers. Cheques should be made payable to "LEFC"